I’ve been a screening technician with the West Yorkshire Abdominal Aortic Aneurysm (AAA) Screening Programme for the past 4 years. We cover a large area that includes Halifax, Huddersfield, Bradford and Craven. 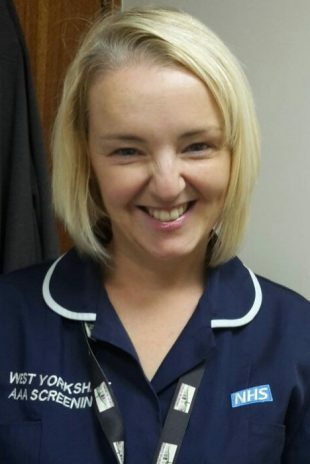 I previously worked as a phlebotomist in the Calderdale and Huddersfield NHS Foundation Trust – before that I was a high street bank fraud investigator! At 8am I travel to today’s clinic at a small community hospital in Bradford. We carry a lot of equipment and my first challenge is loading everything into my car. My second is getting it all out again. We take 2 portable ultrasound machines, a trolley to put the machine on, detergent wipes, couch roll and a folder containing diagrams and information for the men we screen. I arrive at the clinic and meet my colleague Michele, who has arrived with a flat tyre! We set up our equipment and check our list of men to be screened. We have 2 patients who have small aneurysms and are attending for 12-month surveillance scans. The rest of the men have been invited for initial screening tests. Two men on the list have learning disabilities and we are in the process of obtaining best interest decisions on their behalf. We have been unable to scan them previously because they lack the capacity to decide whether to be screened. One of them has a family history of AAA so it’s particularly important for him. Both men arrive with carers who know them well, which makes it a less stressful experience, and we can go ahead with their scans. Meeting the fantastic gentlemen we screen. Most men are delighted to be scanned, while some have obviously been encouraged by their partner. Most have a great sense of humour. Lots of them like to tell us jokes and sometimes they're not very clean (the jokes, not the men). We ask each man to confirm he is consenting to be screened and to having his information stored on the national IT system. We then ask him to lie on the couch and raise his top. We apply gel to the abdomen and move a probe up and down so we can measure the diameter of the aorta. Nearly every man asks us if there is a baby in there or whether it’s twins. Of course, there is a serious side. The first of our surveillance men who has a small aneurysm is anxious when he arrives. Michele and I sit with him and explain that the chances of imminent rupture are very slim indeed. He has received an invitation to attend a patient focus group and we encourage him to take part as he might find it reassuring to meet other men who have an aneurysm. The patient focus group is an informal meeting for men who have aneurysms. Vascular surgeons and a vascular nurse attend too. Feedback has shown the group to be really useful. We scanned a total of 35 men today. We haven’t detected any new aneurysms but we put a lot of men’s minds at rest and this is a very satisfying part of the job. We pack up, load up my car and go home. Tomorrow Skipton, Thursday Wibsey – it’s a glamorous life!